We had 69 competitors for this month's rendition of the Power 9 challenge. 16th was mtgGreg on TKS Shops with a 4-3 record. Congrats to Ryan Eberhart (@diophan) on winning the event and posting a 10-0 record. And as always, thank you for your help on the back end collecting data and working through the spreadsheet after what was surely an exhausting afternoon of winning Vintage matches. Thanks, as always, for collecting and reporting the data. And congratulations @diophan for being very good at Magic. Good grief, Big Blue did awful. Is there any chance I could see the 4c oath deck please? I'm also intrigued about that Oath deck. @Islandswamp I believe I faced this in the practice room yesterday - if so it was similar to Brian Kelly's VSL list, though I think it had more sphere effects in. Certainly, I saw at least two Resistors plus Trinisphere. But maybe if the pilot's on here, he can chip in more. Thanks Matt and Ryan for this - and congrats on the win to boot Ryan! I went 4-3 with a fairly low to the ground UWr Delver list. Two of my losses were to the accursed Eldrazi...going to have to figure out a better plan for that match up. Anyway, well done to everyone who Top 8ed - enjoyed the event muchly. I feel like there's been a nice amount of activity recently in the Practice Room on MTGO, including many names who I didn't see in the actual P9 Challenge. Be great if we could convert some of those players somehow in participants for future events. Struggled vs TKS yesterday (what else is knew) which put me at 4-3 and finished 24th to break even. Huge congrats to Ryan (Diophan) for running the table 10-0. Thanks again to you and Matt for doing the stats. Thanks for the tournament report Rain. For those of you asking. My Oath deck sounds more interesting than it actually was. Ill post decklist at the bottom though. After last Power 9 and recent live vintage events I expected an eldrazi/shops heavy meta. So I decided Thursday I would run oath if I could find a list I was comfortable with. Went ahead and tested a bunch of different oath lists I saw in the top 8 of paper in the last 6 months (as well as Brian Kellys crazy VSL one). So tried show and tell oath, storm oath, dragon breath, tinker + blightsteel or sphinx, and with and without key combo. And so on. Made tweaks and eventually decided on the one I did. But really it doesnt do anything too new or different. The most unique part is probably the ability to go leyline + rest in peace + helm along with time vault and take out the oath package in matchups where I expected heavy oath hate. In testing I liked having the ability to let your opponent cast all the cages, priests, and hexproof x cards and save your counter magic and removal for other cards. Just felt like a large card advantage line that would catch players off guard. It wasnt a go to sb plan every single match. But based on colors, expected or seen hate, and the type of matchup I would or wouldnt do so. It won me some games I may have otherwise lost. Anyway, lost rd 1 to a Blood moon control deck with at least 5 planeswalkers. T1 blood moon is pretty nasty vs oath. Made it close with some combination of yag will, lotus, mox, and abrupt decay. But his deck was well positioned vs mine and he won as I would expect him to do most of the time. Then I won 5 straight rds only losing 1-2 to Diophan for my into top 8 match. I beat the mirror and all the shops/eldrazi decks I played. Thats why I picked the deck. So I can take some comfort in that. There must have been 18-20 Cabal Therapies in the top 8. 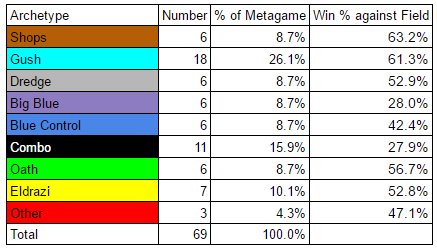 Updated with Archetype vs Archetype stats and a link to the top 16 deck lists. To contribute something useful, probably many people have noticed this, but I believe the reason that discard is good now is because traditional answer cards are as bad as they've been in a long time. FOW is less useful because of cavern and defense grid. Bolt removes maybe half the creatures being played. In the past you could load up on artifact removal to beat thorn decks, but the Eldrazi invasion, in particular Jacodrazi, have blanked that as a uniform answer. You want some amount of creature removal, but still need artifact removal to not get sphered out by actual Workshop decks. Even if you have the right removal spell, TKS can dispatch that before it can be deployed. All of this, combined with sideboards only having 15 slots, heavily incentivizes you to play the only universal answer left, which is unconditional discard in thoughtseize and therapy. In certain matchups these aren't great cards, but they are always at least acceptable, which is more than you can say about most interactive cards right now. I like the top8 decks. I feel like my deck was unfavored in the finals. @diophan had a better "card advantage" gameplan. Its hard to win the control game vs 4 cabal therapy + 1 fluster/1pyroblast even though I also had alot of counters. My mentor build is/was not that fast. I really like @diophan 's deck and I think he played well in our games. He deserved to win this thing imo.